Containing orange flower oil and pelargonium graveolens extract to form a protective membrane to lock in color, this leaves the hair shining and vivacious. Specially formulated protein to strengthen hair from within while the naturally extracted sunscreen factor can protect hair color from fading caused by UV rays. Hair will look soft, vibrant and lustrous after coloring. Wet hair and apply shampoo, gently working lather into scalp and hair. Rinse thoroughly. For best results, follow with Orange Flower Shining Color Conditioner. 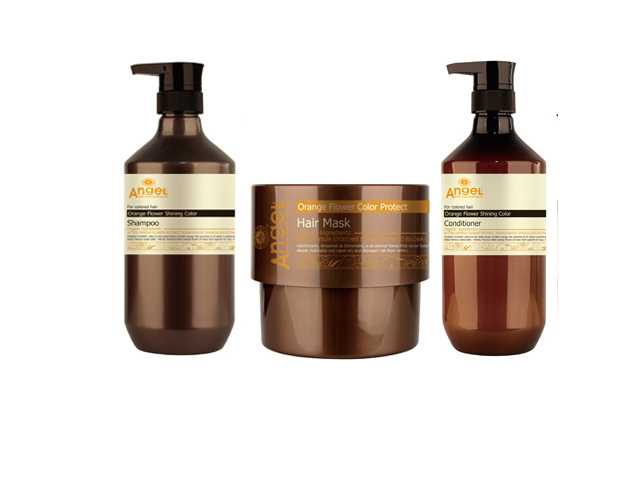 Protects hair against environmental damages from sun and water leaving hair soft and vibrant with a lustrous shine. BITTER ORANGE FLOWER EXTRACT, PELARGONIUM GRAVEOLENS EXTRACT, ROSE EXTRACT (For coloured hair) Orange flower refers to the white flower of bitter orange, the essential oil of which is extremely and exquisite and smooth so to be titled under an Italian famous noble belle – Nerola. Precious bitter orange flower oil helps fight against UV rays, maintain hair color at its.